Has it been two and half months already? Good grief! Good news! 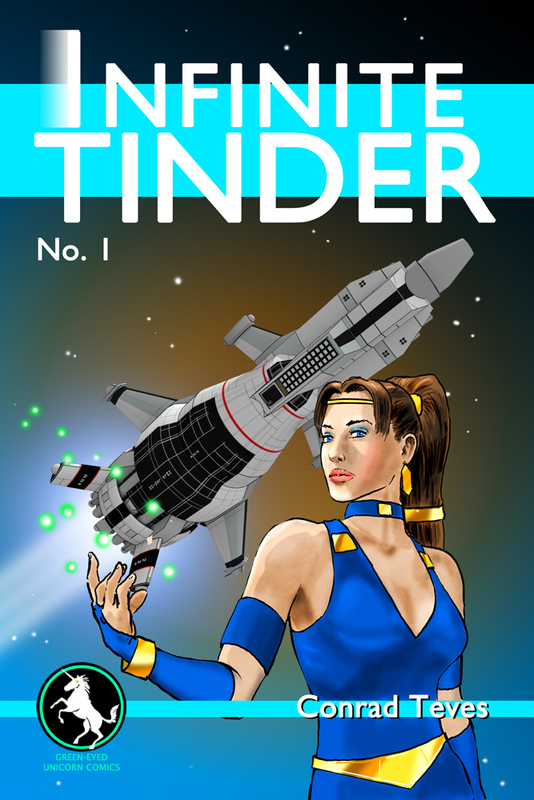 Infinite Tinder No.1 is now complete! Thanks to Christa Yelich-Koth for her excellent editorial work, and thanks to Jason Pape and Stu Tighe for their proof-reading and additional editorial support. I can't underscore the value of having good editors backing you up. The new book will be available on May 16th at the MCBA's MSP Comicon. Here's the cover! Have started using The Foundry's Mischief as a drawing program in conjunction with Photoshop. I am extremely impressed by the way the program handles. It is the most pencil/pen and paper like experience I have yet had in digital art. If any of you draw, I'd give it a whirl! Back at it after a week of being sick. Nice how you can be exhausted after being sick, which by itself leaves you too tired to do anything. Should have taken notes though: those were some funky dreams. Anyway, I'm all good now. Let the making of art...commense! Nearly complete panel layouts for Hollow's Prism #4, and panel layouts for Infinite Tinder #1 are done! I don't know about you, but I'm kinda anxious to see how all this is going to look! Hey! Long time no see. Sigh. I finally got some time to work on the website, and am trying to set aside a regular amount of time to do so. Instead of working on something until I drop, or it's finished, I am trying to wrap my head around the concept of budgeting time. We'll see how that goes. Life is one long learning experience, no? You may have noticed that the gallery section is changing! Yes, I'm finally starting to get things in order. In other Good News, Hollow's Prism #4 is in production, as well as Infinite Tinder #1. Stay Tuned! SpringCon 2014 is only one week away! Also, we will be excited to have Hollow's Prism No.2 available at our Launch at the Richfield, MN Hot Comics and Collectibles on Friday the 16th! Christa and I will be in-store from 3pm to 6pm. Drop by and say hi! Hey all! Taking a an ever-so-brief break from drawing to let you know Hollow's Prism No.2 will be ready soon! Christa and I will have a table at Spring Con 2014, so there is much fun to come! More news soon, but first--back to the drawing board! Literally! I concede I have been somewhat remiss in the blog entries. I will try and rectify that. I have to budget between site maintenance, actually working on my projects and sleep, etc. This should be much easier once the site it more complete, but I hope you will bear with me until it is. Updates? Christa and I are working on the second issue of Hollow's Prism which is coming along nicely. As a modification of my last post, I have decided to go to a purely digital workflow. It should help improve consistancy, and more to the point, allow me to complete a book in two months instead of three. My new Wacom Cintiq digitizer tablet is making the process not only easier, but more fun due to the softer time constraints. Also, I'd like to announce a solo project of mine: Infinite Tinder. This will be a maxi-series of about a dozen issues as currently planned. It surrounds the goings-on in a multiverse of parallel realities, where worlds, nations and languages to a degree are replicated in an alternate form, but never individuals. Except one. This has been a lot of fun to develop, and I hope to share the first issue with you soon! My new digital workflow will permit me to write/draw Tinder at the same time I draw Hollow's Prism. Stay tuned! I've adopted a new (frankly, a more modern) workflow for the production art to Prism. Instead of inking directly over the pencilled artwork (which is very old-school), I've gone to the method of scanning the pencils, then printing them back out on bristol board in blue. I then ink over that, and then scan those with the "drop blue" function on my scanner activated, thus eliminating the need to erase any stray pencil on the art boards. The level of convenience this affords cannot be understated. Not only does it eliminate a tedious step, it preserves the original pencils intact, and also means that any last-minute changes can be done on the original pencils without having to re-draw a whole page. So far, however, I have not yet had to change any finished art. Minor update: the cover for Hollow's Prism: Aftermath is pretty much ready to go, not counting a little minor tweaking here and there. We will be having the reveal on August 10th, 2013. Personally, I think it has a nice classic look to it, and people who have been getting a preview of it seem to be reacting very positively! Wow, time flies! How often is that a good thing? Anyway, we should have the cover reveal for Hollow's Prism up shortly. Hope you like it as much as we do! Check Christa Yelich-Koth's poll on the choice between Free Will and Happiness (the tag line for Hollow). Interesting results. We have had some interesting in-person feedback on that point. Most, like in the poll, seem to pick Free Will, but one visistor to our table at SpringCon, said he had had enough of Free Will and wanted Happiness instead. Another guy I spoke to looked at the book, the shadowy Chear soldier looming menacingly on the cover, and said "I want which ever gets me away from that guy!" Perhaps even that choice can be context sensitive? After a recent computer fail, I'm back up and running, and production on Hollow's Prism is in full-swing. We are getting some cool-looking pages, and I am very pleased how it's shaping up! A title has been chosen for the "Hollow" follow-on book! Well, the site's up, and though it is still largely under construction, you should see the content and functionality increasing steadily as the weeks go by. SpringCon is over, and boy was that fun! Exhausting, but really fun! Many thanks to everyone who visited our table, bought our book and otherwise made the convention such a blast. Thanks to the guys from Twin City Comics, Jeremy, Tom and Pete for being so spectacularly awesome to us. Special thanks to our fellow creators Doug Kallberg, Chad Corrie, Matt Chicorel for dropping by the table and adding to the fun. Super special thanks to the Great Jose Luis Garcia Lopez for simply being there and being gracious enough to sign a book for me (TREASURE!). If you haven't made it out to one of these conventions yet, I highly recommend it. The people, the costumes the comics and the creators make for a magical day out. You won't regret it.